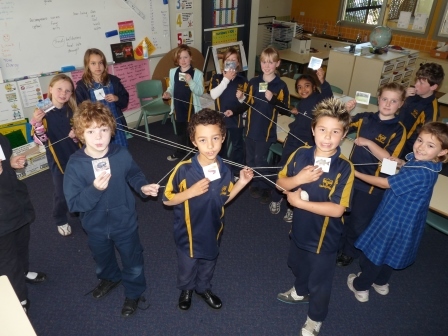 Dora Creek Public School students demonstrating a 'web of life'. The 'Reduce - Prepare - Respond' education kit is designed to guide learning opportunities related to climate change, its causes, consequences and what we can do about it. The kit contains a comprehensive program of lesson plans and activities that look at the science and information underpinning climate change, and managing waste, water and energy. The kit can be used to implement a whole unit of work, or lesson plans can be used independently for one-off activities, and is suitable for both children and adult learning groups. In 2010 the program was trialled at Dora Creek Public School with great success. The kit is available for Sustainable Neighbourhood and other community groups to introduce to their local school or to implement with local community groups. Join us for a workshop about the development and implementation of this education kit, and how you can engage with your local school or community group to utilise this great resource. Jenny Windibanks who developed the kit, and Jacquie Green from Dora Creek Primary School will be presenting a fun evening to share their wealth of experience in using the kit. Location: Dora Creek Hall, 2 Doree Place, Dora Creek. Bookings are essential to the Lake Macquarie Sustainable Neighbourhood Alliance on 4921 0117 or admin@sustainableneighbourhoods.org.au. Please let us know if you intend on coming, or if your plans change. If we don't get enough initial interest, we may cancel or reschedule the workshop.